"The Rule of Faith and Practice"
Originally published in 1860, Outlines of Theology is now in the public domain. This chapter may therefore be copied and distributed without restriction. The Scriptures of the Old and New Testaments, Having Been Given By Inspiration of God, Are the All-Sufficient and Only Rule of Faith and Practice, and Judge of Controversies. 1. What is meant by saying that the Scriptures are the only infallible rule of faith and practice? 2. What does the Romish Church declare to be the infallible rule of faith and practice? The Romish theory is that the complete rule of faith and practice consists of Scripture and tradition, or the oral teaching of Christ and his apostles, handed down through the Church. Tradition they hold to be necessary, 1st, to teach additional truth not contained in the Scriptures; and, 2nd, to interpret Scripture. The Church being the divinely constituted depository and judge of both Scripture and tradition.—"Decrees of Council of Trent," Session IV, and "Dens Theo.," Tom. 2., N. 80 and 81. 3. By what arguments do they seek to establish the authority of tradition? By what criterion do they distinguish true traditions from false, and on what grounds do they base the authority of the traditions they receive? 1st. Their arguments in behalf of tradition are — (1.) Scripture authorizes it, 2 Thess. 2:15; 3:6. (2.) The early fathers asserted its authority and founded their faith largely upon it. (3.) The oral teaching of Christ and his apostles, when clearly ascertained, is intrinsically of equal authority with their writings. The scriptures themselves are handed down to us by the evidence of tradition, and the stream cannot rise higher than its source. (4.) The necessity of the case. (a.) Scripture is obscure, needs tradition as its interpreter. (b. )Scripture is incomplete as a rule of faith and practice; since there are many doctrines and institutions, universally recognized, which are founded only upon tradition as a supplement to Scripture. (5.) Analogy. every state recognizes both written and unwritten, common and statute law. 2nd. The criterion by which they distinguish between true and false traditions is Catholic consent. The Anglican ritualists confine the application of the rule to the first three or four centuries. the Romanists recognize that as an authoritative consent which is constitutionally expressed by the bishops in general council, or by the Pope ex-cathedra, in any age of the church whatever. 3rd. They defend the traditions which they hold to be true. (1.) On the ground of historical testimony, tracing them up to the apostles as their source. (2.) The authority of the Church expressed by Catholic consent. 4. By what arguments may the invalidity of all ecclesiastical tradition, as a part of our rule of faith and practice, be shown? 1st. The Scriptures do not, as claimed, ascribe authority to oral tradition. Tradition, as intended by Paul in the passage cited (2 Thess. 2:15, and 3:6), signifies all his instructions, oral and written, communicated to those very people themselves, not handed down. On the other hand, Christ rebuked this doctrine of the Romanists in their predecessors, the Pharisees, Matt. 15:3,6; Mark 7:7. 2nd. It is improbable a priori that God would supplement Scripture with tradition as part of our rule of faith. (1.) Because Scripture, as will be shown below (questions 7-14), is certain, definite, complete, and perspicuous. (2.) Because tradition, from its very nature, is indeterminate, and liable to become adulterated with every form of error. Besides, as will be shown below (question 20), the authority of Scripture does not rest ultimately upon tradition. 3rd The whole ground upon which Romanists base the authority of their traditions (viz., history and church authority) is invalid. (1.) History utterly fails them. For more than three hundred years after the apostles they have very little, and that contradictory, evidence for any one of their traditions. They are thus forced to the absurd assumption that what was taught in the fourth century was therefore taught in the third, and therefore in the first. (2.) The church is not infallible, as will be shown below (question 18). 4th. Their practice is inconsistent with their own principles. Many of the earliest and best attested traditions they do not receive. Many of their pretended traditions are recent inventions unknown to the ancients. 5th. Many of their traditions, such as relate to the priesthood, the sacrifice of the mass, etc., are plainly in direct opposition to Scripture. Yet the infallible church affirms the infallibility of Scripture. A house divided against itself cannot stand. 5. What is necessary to constitute a sole and infallible rule of faith? Plenary inspiration, completeness, perspicuity or clarity, and accessibility. 6. What arguments do the Scriptures themselves afford in favor of the doctrine that they are the only infallible rule of faith? 1st. The Scriptures always speak in the name of God, and command faith and obedience. 2nd. Christ and his apostles always refer to the written Scriptures, then existing, as authority, and to no other rule of faith whatsoever.—Luke 16:29; 10:26; John 5:39; Rom. 4:3;2 Tim. 3:15. 3rd. The Bereans are commended for bringing all questions, even apostolic teaching, to this test.—Acts 17:11; see also Isa. 8:16. 4th. Christ rebukes the Pharisees for adding to and perverting the Scriptures.—Matt. 15:7-9; Mark 7:5-8; see also Rev. 22:18, 19, and Deut. 4:2; 12:32; Josh. 1:7. 7. In what sense is the completeness of Scripture as a rule of faith asserted? It is not meant that the Scriptures contain every revelation which God has ever made to man, but that their contents are the only supernatural revelation that God does now make to man, and that this revelation is abundantly sufficient for man's guidance in all questions of faith, practice, and modes of worship, and excludes the necessity and the right of any human inventions. 8. How may this completeness be proved, from the design of scripture? The Scriptures profess to lead us to God. Whatever is necessary to that end they must teach us. If any supplementary rule, as tradition, is necessary to that end, they must refer us to it. "Incompleteness here would be falsehood." But while one sacred writer constantly refers us to the writings of another, not one of them ever intimates to us either the necessity or the existence of any other rule.—John 20:31; 2 Tim. 3:15-17. 9. By what other arguments may this principle be proved? As the Scriptures profess to be a rule complete for its end, so they have always been practically found to be such by the true spiritual people of God in all ages. They teach a complete and harmonious system of doctrine. They furnish all necessary principles for the government of the private lives of Christians, in every relation, for the public worship of God, and for the administration of the affairs of his kingdom; and they repel all pretended -traditions and priestly innovations. 10. In what sense do Protestants affirm and Romanists deny the perspicuity of Scripture? Protestants do not affirm that the doctrines revealed in the Scriptures are level to man's powers of understanding. Many of them are confessedly beyond all understanding. Nor do they affirm that every part of Scripture can be certainly and perspicuously expounded, many of the prophesies being perfectly obscure until explained by the event. But they do affirm that every essential article of faith and rule of practice is clearly revealed in Scripture, or may certainly be deduced therefrom. This much the least instructed Christian may learn at once; while, on the other hand, it is true, that with the advance of historical and critical knowledge, and by means of controversies, the Christian church is constantly making progress in the accurate interpretation of Scripture, and in the comprehension in its integrity of the system therein taught. Protestants affirm and Romanists deny that private and unlearned Christians may safely be allowed to interpret Scripture for themselves. 11. How can the perspicuity of scripture be proved from the fact that it is a law and a message? We saw (question 8) that Scripture is either complete or false, from its own professed design. We now prove its perspicuity upon the same principle. It professes to be (1) a law to be obeyed; (2) a revelation of truth to be believed, to be received by us in both aspects upon the penalty of eternal death. To suppose it not to be perspicuous, relatively to its design of commanding and teaching is to charge God with clearing with us in a spirit at once disingenuous and cruel. 12. In what passages is their perspicuity asserted? Ps. 19:7,8; 119:105,130; 2 Cor. 3:14; 2 Pet. 1:18,19; Hab. 2:2; 2 Tim. 3:15,17. 13. By what other arguments may this point be established? 1st. The Scriptures are addressed immediately, either to all men indiscriminately, or else to the whole body of believers as such.—Deut. 6:4-9; Luke 1:3; Rom. 1:7; 1 Cor. 1:2; 2 Cor. 1:1; 4:2; Gal. 1:2; Eph. 1:1; Phil. 1:1; Col. 1:2; James 1:1; 1 Peter 1:1; 2 Peter 1:1; 1 John 2:12,14; Jude 1:1; Rev. 1:3,4; 2:7. The only exceptions are the epistles to Timothy and Titus. 2nd. All Christians indiscriminately are commanded to search the Scriptures.—2 Tim. 3:15,17; Acts 17:11; John 5:39. 3rd. Universal experience. We have the same evidence of the light-giving power of Scripture that we have of the same property in the sun. The argument to the contrary, is an insult to the understanding of the whole world of Bible readers. 4th. The essential unity in faith and practice, in spite of all circumstantial differences, of all Christian communities of every age and nation, who draw their religion directly from the open Scriptures. 14. What was the third quality required to constitute the scriptures the sufficient rule of faith and practice? Accessibility. It is self-evident that this is the pre-eminent characteristic of the Scriptures, in contrast to tradition, which is in the custody of a corporation of priests, and to every other pretended rule whatsoever. The agency of the church in this matter is simply to give all currency to the word of God. 15. What is meant by saying that the Scriptures are the judge as well as the rule in questions of faith? 1st. That the Scriptures are the only infallible rule of faith and practice. 2nd. (1.) negatively. That there is no body of men who are either qualified, or authorized, to interpret the Scriptures, or apply their principles to the decision of particular questions, in a sense binding upon the faith of their fellow Christians. (2.) Positively. That Scripture is the only infallible voice in the church, and is to be interpreted, in its own light, and with the gracious help of the Holy Ghost, who is promised to every Christian (1 John 2:20-27), by each individual for himself; with the assistance, though not by the authority, of his fellow Christians. Creeds and confessions, as to form, bind only those who voluntarily profess them, and as to matter, they bind only so far as they affirm truly what the Bible teaches, and because the Bible does so teach. 16. What is the Romish doctrine regarding the authority of the church as the infallible interpreter of the rule of faith and the authoritative judge of all controversies? The Romish doctrine is that the church is absolutely infallible in all matters of Christian faith and practice, and the divinely authorized depository and interpreter of the rule of faith. Her office is not to convey new revelations from God to man, yet her inspiration renders her infallible in disseminating and interpreting the original revelation communicated through the apostles. The church, therefore, authoritatively determines—1st. What is Scripture. 2nd. What is genuine tradition 3rd. What is the true sense of Scripture and 'tradition', and what is the true application of that perfect rule to every particular question of belief or practice. This authority vests in the pope, when acting in his official capacity, and in the bishops as a body, as when assembled in general council, or when giving universal consent to a decree of pope or council.—"Decrees of Council of Trent," Session 4.; "Deus Theo.," N. 80, 81, 84, 93, 94, 95, 96. "Bellarmine," Lib. 3., de eccles., cap. 14., and Lib. 2., de council., cap. 2. 17. By what arguments do they seek to establish this authority? 1st. The promises of Christ, given, as they claim, to the apostles, and to their official successor, securing their infallibility, and consequent authority.—Matt. 16:18; 18:18-20; Luke 24:47-49; John 16:13; 20:23. 2nd. The commission given to the church as the teacher of the world.—Matt. 28:19, 20; Luke 10:16, etc. 3rd. The church is declared to be "the pillar and ground of the truth," and it is affirmed that "the gates of hell shall never prevail against her." 4th. To the church is granted power to bind and loose, and he that will not hear the church is to be treated as a heathen. Matt. 16:19; 18:15-18. 5th. The church is commanded to discriminate between truth and error, and must consequently be qualified and authorized to do so—2 Thessalonians 3:6; Romans 16:17; 2 John 10. 6th. From the necessity of the case, men need and crave an ever-living, visible, and cotemporaneous infallible Interpreter and Judge. 7th. From universal analogy every community among men has the living judge as well as the written law, and the one would be of no value without the other. 8th. This power is necessary to secure unity and universality, which all acknowledge to be essential attributes of the true church. 18. By what arguments may this claim of the Romish church be shown to be utterly baseless? 1st. A claim vesting in mortal men a power so momentous can be established only by the most clear and certain evidence, and the failure to produce such converts the claim into a treason at once against God and the human race. 2nd. Her evidence fails, because the promises of Christ to preserve his church from extinction and from error do none of them go the length of pledging infallibility. The utmost promised is, that the true people of God shall never perish entirely from the earth, or be left to apostatize from the essentials of the faith. 3rd. Her evidence fails, because these promises of Christ were addressed not to the officers of the church as such, but to the body of true believers. Compare John 20:23 with Luke 24:33,47,48,49, and 1 John 2:20,27. 4th. Her evidence fails, because the church to which the precious promises of the Scriptures are pledged is not an external, visible society, the authority of which is vested in the hands of a perpetual line of apostles. For—(1.) the word church ekklhsia is a collective term, embracing the effectually called klhtoi or regenerated.—Rom. 1:7; 8:28; 1 Cor. 1:2; Jude 1:; Rev. 17:14; also Rom. 9:24; 1 Cor. 7:18-24; Gal. 1:15; 2 Tim. 1:9; Heb. 9:15; 1 Pet. 2:9; 5:10; Eph. 1:18; 2 Pet. 1:10. (2.) The attributes ascribed to the church prove it to consist alone of the true, spiritual people of God as such.—Eph. 5:27; 1 Pet. 2:5; John 10:27; Col. 1:18,24. (3.) The epistles are addressed to the church, and in their salutations explain that phrase as equivalent to "the called,""the saints,""all true worshippers of God;" witness the salutations of 1st and 2nd Corinthians, Ephesians, Colossians, 1st and 2nd Peter and Jude. The same attributes are ascribed to the members of the true church as such throughout the body of the Epistles.— 1 Cor. 1:30; 3:16; 6:11,19; Eph. 2:3-8, and 19-22; 1 Thess. 5:4,5; 2 Thess. 2:13; Col. 1:21; 2:10; 1 Pet. 2:9. 5th. The inspired apostles have had no successors. (1.) There is no evidence that they had such in the New Testament. (2.) While provision was made for the regular perpetuation of the offices of presbyter and deacon (1 Tim. 3:1-13), there are no directions given for the perpetuation of the apostolate. (3.) There is perfect silence concerning the continued existence of any apostles in the church in the writings of the early centuries. Both the name and the thing ceased. (4.) No one ever claiming to be one of their successors have possessed the "signs of an apostle. "—2 Cor. 12:12; 1 Cor. 9:1; Gal. 1:1,12; Acts 1:21,22. 6th. This claim, as it rests upon the authority of the Pope, is utterly unscriptural, because the Pope is not known to Scripture. As it rests upon the authority of the whole body of the bishops, expressed in their general consent, it is unscriptural for the reasons above shown, and it is, moreover, impracticable, since their universal judgment never has been and never can be impartially collected and pronounced. 7th. There can be no infallibility where there is not self- consistency. But as a matter of fact the Papal church has not been self-consistent in her teaching. (1.) She has taught different doctrines in different sections and ages. (2.) She affirms the infallibility of the holy Scriptures, and at the same time teaches a system plainly and radically inconsistent with their manifest sense; witness the doctrines of the priesthood, the mass, penance, of works, and of Mary worship. Therefore the Church of Rome hides the Scriptures from the people. 8th. If this Romish system be true then genuine spiritual religion ought to flourish in her communion, and all the rest of the world ought to be a moral desert. The facts are notoriously the reverse. If; therefore, we admit that the Romish system is true, we subvert one of the principal evidences of Christianity itself; viz., the self-evidencing light and practical power of true religion, and the witness of the Holy Ghost. 19. By what direct arguments may the doctrine that the Scriptures are the final judge of controversies be established? 1st. Scripture is perspicuous, see above, questions 11-13. 2nd. Scripture is addressed to all Christians as such, see above, question 13. 3rd. All Christians are commanded to search the scriptures, and by them to judge all doctrines and all professed teachers.—John 5:39; Acts 17:11; Gal. 1:8; 2 Cor. 4:2; 1 Thess. 5:21; 1 John 4:1,2. 4th. The promise of the Holy Spirit, the author and interpreter of Scripture, is to all Christians as such. Compare John 20:23 with Luke 24:47-49; 1 John 2:20,27; Rom. 8:9; 1 Cor. 3:16, 17. 5th. Religion is essentially a personal matter. Each Christian must know and believe the truth explicitly for himself; on the direct ground of its own moral and spiritual evidence, and not on the mere ground of blind authority. Otherwise faith could not be a moral act, nor could it "purify the heart." Faith derives its sanctifying power from the truth which it immediately apprehends on its own experimental evidence.—John 17:17, 19; James 1:18; 1 Pet. 1:22. 20. What is the objection which the Romanists make to this doctrine, on the ground that the church is our only authority for believing that the scriptures are the word of God? Their objection is, that as we receive the scriptures as the word of God only on the authoritative testimony of the church, our faith in the Scriptures is only another form of our faith in the church, and the authority of the church, being the foundation of that of Scripture, must of course be held paramount. 1st. The assumed fact is false. The evidence upon which we receive Scripture as the word of God is not the authority of the church, but—(1.) God did speak by the apostles and prophets, as is evident (a) from the nature of their doctrine, (b) from their miracles, (c) their prophecies, (d) our personal experience and observation of the power of the truth. (2.) These very writings which we possess were written by the apostles, etc., as is evident, (a) from internal evidence, (b) from historical testimony rendered by all competent cotemporaneous witnesses in the church or out of it. 2nd. Even if the fact assumed was true, viz., that we know the Scriptures to be from God, on the authority of the church's testimony alone, the conclusion they seek to deduce from it would be absurd. The witness who proves the identity or primogenitor of a prince does not thereby acquire a right to govern the kingdom, or even to interpret the will of the prince. 21. How is the argument for the necessity of a visible judge, derived from the diversities of sects and doctrines among Protestants, to be answered? 1st. We do not pretend that the private judgment of Protestants is infallible, but only that when exercised in a humble, believing spirit, it always leads to a competent knowledge of essential truth. 2nd. The term Protestant is simply negative, and is assumed by many infidels who protest as much against the Scriptures as they do against Rome. But Bible Protestants, among all their circumstantial differences, are, to a wonderful degree, agreed upon the essentials of faith and practice. Witness their hymns and devotional literature. 3rd. The diversity that does actually exist arises from failure in applying faithfully the Protestant principles for which we contend. Men do not simply and without prejudice take their creed from the Bible. 4th. The Catholic church, in her last and most authoritative utterance through the Council of Trent, has proved herself a most indefinite Judge. Her doctrinal decisions need an infallible interpreter infinitely more than the Scriptures. 22. How may it be shown that the Romanist theory, as well as the Protestant, necessarily throws upon the people the obligation of private judgment? Is there a God? Has he revealed himself? Has he established a church? Is that church an infallible teacher? Is private judgment a blind leader? Which of all pretended churches is the true one? Every one of these questions evidently must be settled in the Private judgment of the inquirer, before he can, rationally or irrationally, give up his private judgment to the direction of the self-asserting church. Thus of necessity Romanists appeal to the Scriptures to prove that the Scriptures cannot be understood, and address arguments to the private judgment of men to prove that private judgment is incompetent; thus basing an argument upon that which it is the object of the argument to prove is baseless. 23. How may it be proved that the people are far more competent to discover what the Bible teaches than to decide, by the marks insisted upon by the Romanists, which is the true church? The Romanists, of necessity, set forth certain marks by which the true church is to be discriminated from all counterfeits. These are (1.) Unity (through subjection to one visible head, the Pope); (2.) Holiness; (3.) Catholicity; (4.) Apostolicity, (involving an uninterrupted succession from the apostles of canonically ordained bishops.)—"Cat. of Council of Trent," Part 1., Cap. 10. Now, the comprehension and intelligent application of these marks involve a great amount of learning and intelligent capacity upon the part of the inquirer. He might as easily prove himself to be descended from Noah by an unbroken series of legitimate marriages, as establish the right of Rome to the last mark. Yet he cannot rationally give up the right of studying the Bible for himself until that point is made clear. Surely the Scriptures, with their self-evidencing spiritual power, make less exhaustive demands upon the resources of private judgment. ROMAN CATHOLIC DOCTRINE AS TO THE PRIVATE INTERPRETATION OF SCRIPTURE, AND AS TO TRADITION, AND AS TO THE INFALLIBILITY OF THE POPE. 1st. AS TO THE INTERPRETATION OF SCRIPTURE.—"Decrees of council of Trent," Sess. 4. — "Moreover the same sacred and holy Synod ordains and declares, that the said old and Vulgate edition, which, by the lengthened usage of so many ages, has been approved of in the Church, be in public lectures, disputations, sermons, and expositions held as authentic; and that no one is to dare or presume to reject it under any pretext whatever." "Furthermore, in order to restrain petulant spirits, it decrees that no one, relying on his own skill shall in matters of faith and of morals pertaining to the edification of Christian doctrine, wresting the sacred Scripture to his own senses, presume to interpret the said sacred scripture contrary to that sense which holy mother church—whose it is to judge of the true sense and interpretation of the Holy scriptures —hath held and doth hold, or even contrary to the unanimous consent of the Fathers; even though such interpretations were never (intended) to be at any time published." "Dogmatic Decrees of the Vatican council," ch. 2.—"And as the things which the holy Synod of Trent decreed for the good of souls concerning the interpretation of Divine Scripture, in order to curb rebellious spirits, have been wrongly explained by some, we, renewing the said decree, declare this to be their sense, that, in matters of faith and morals, appertaining to the building up of Christian doctrine, that is to be held as the true sense of Holy Scripture which our holy mother Church hath held and holds, to whom it belongs to judge of the true sense of the Holy Scripture; and therefore that it is permitted to no one to interpret the sacred scripture contrary to this sense, nor, likewise contrary to the unanimous consent of the Fathers. " 2nd. AS TO TRADITION.—"Prof. Fidei Tridentinoe"—(A. D. 1564) 2. and 3. "I most steadfastly admit and embrace apostolic and ecclesiastic traditions, and all other observances and constitutions of the same Church. I also admit the Holy scriptures, according to that sense which our holy mother Church has held and does hold, to which it belongs to judge of the true sense and interpretation of the Scriptures, neither will I ever take and interpret them otherwise than according, to the unanimous consent of the Fathers." "Council of Trent," Sess. 4.—"And seeing clearly that this truth and discipline are contained in the written books, and the unwritten traditions which, received by the apostles from the mouth of Christ himself or from the apostles themselves the Holy Ghost dictating, have come down even unto us transmitted as it were from hand to hand." 3rd. AS TO THE ABSOLUTE AUTHORITY OF THE POPE.—"Dogmatic Decisions of the Vatican Council," chap. 3.—"Hence we teach and declare that by the appointment of our Lord . . . the power of jurisdiction of the Roman Pontiff is immediate, to which all, of whatever rite and dignity, both pastors and faithful, both individually and collectively, are bound, by their duty of hierarchical subordination and true obedience, to submit not only in matters which belong to faith and morals, but also in those that appertain to the discipline and government of the Church throughout the world. . . . We further teach and declare that he is the supreme judge of the faithful, and that in all causes, the decision of which belongs to the Church, recourse may be had to his tribunal, and that none may reopen the judgment of the Apostolic See, than whose authority there is no greater, nor can any lawfully review his judgment. Wherefore they err from the right course who assert that it is lawful to appeal from the judgments of the Roman Pontiff to an ecumenical council, as to an authority higher than that of the Roman Pontiff." 4th. CONCERNING THE ABSOLUTE INFALLIBILITY OF THE POPE AS THE TEACHER OF THE UNIVERSAL CHURCH.—"Dogmatic Decrees of the Vatican Council," Chap. 4.—"Therefore faithfully adhering to the tradition received from the beginning of the Christian faith, for the glory of God our Saviour, the exaltation of the Catholic religion, and the salvation of Christian people, the sacred Council approving, we teach and define that it is a dogma divinely revealed: That the Roman Pontiff when he speaks ex cathedra, that is, when in discharge of the office of pastor and doctor of all Christians, by virtue of his supreme Apostolic authority, he defines a doctrine regarding faith or morals to he held by the universal Church, by the divine assistance promised to him in blessed Peter, is possessed of the infallibility with which the divine Redeemer willed that his Church should be endowed for defining doctrine according to faith and morals; and that therefore such definitions of the Roman Pontiff are irreformable of themselves, and not from the consent of the church. But if any one—which may God avert—presume to contradict this our definition: let him be anathema." Cardinal Manning in his "Vatican Council" says, "In this definition there are six points to be noted:"
"1st. It defines the meaning of the well-known phrase loquens ex cathedra; that is, speaking from the Seat, or place, or with the authority of the supreme teacher of all Christians, and binding the assent of the universal Church." "2nd. The subject matter of the infallible teaching, namely, the doctrine of faith and morals." "3rd. The efficient cause of infallibility, that is, the divine assistance promised to Peter, and in Peter to his successors." "4th. The act to which this divine assistance is attached, the defining of doctrines of faith and morals." "5th. The extension of this infallible authority to the limits of the doctrinal office of the Church." "6th. The dogmatic value of the definitions ex cathedra, namely that they are in themselves irreformable, because in themselves infallible, and not because the Church, or any part or member of the Church, should assent to them." "Dogmatic Decrees of Vatican Council" Ch. 4.—"For the Holy Spirit was not promised to the successors of Peter, that by his revelation they might make known new doctrine; but that by his assistance they might inviolably keep and faithfully expound the revelation or deposit of faith delivered through the Apostles." 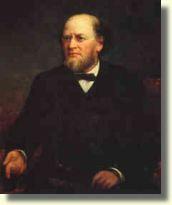 A.A. Hodge (1823-1886), Professor in Systematic Theology at Princeton Seminary from 1877 until his death in 1886, urged that the aim of every Christian teacher should be to produce a vitalizing impression — giving students ‘theology, exposition, demonstration, orthodoxy, learning, but giving all this to them warm.’ ‘He taught the knowledge of God,’ said one of his hearers, ‘with the learning of a scholar and the enthusiasm of a loving Christian’. These qualities not only crowded his classrooms, they also led to frequent appeals for the delivery of popular lectures. This article is taken from his, Outlines of Theology, first published in 1860 by the Banner of Truth Trust.